I am always scouting for recipes. Years ago we were staying at the Sanderling Inn on the Outer Banks of NC. There in the gathering room was a collection of cookbooks which I jotted this recipe down from. Couldn’t tell you who the author is, but this recipe is wonderful. I have used it over and over and never get tired of it. It elevates a simple bowl of berries to another level. This is also great on top of peach sorbet (or any sorbet for that matter). The only tricky part is not cooking the egg yolks at too high a heat. Stay focused, be patient and the reward will be great. Straining the egg mixture through a fine mesh strainer when you finish cooking will take out any lumps if the cooking has gone too far. I do not have a double boiler pan. I use a 2 quart sauce pan half filled with water and put a large stainless steel bowl over top. It says serves 6, but that would be a very generous portion. 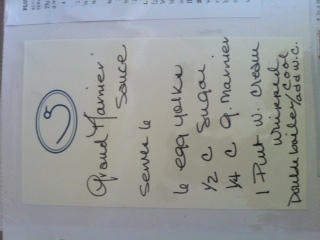 This entry was posted in Recipes and tagged dessert, dessert sauce, Grand Marnier, Whipped Cream. Bookmark the permalink. Yes, it is quite good, and you will need discipline to house the leftovers in the refrigerator….